Newton Aycliffe family business Stiller Warehousing and Distribution is on a new recruitment drive after its latest expansion. Stiller has completed a new 40,000 sq ft warehouse at its huge 20-acre site on Aycliffe Business Park, costing £750,000. The new development, standing at 10 metres tall, is an extension to an existing 40,000 sq ft unit, which opened in September 2015, and further increases Stiller’s warehousing capabilities, providing space for another 5,500 pallets. The firm, which currently employs 138 people, is now looking to create 10 new jobs as part of its latest expansion. 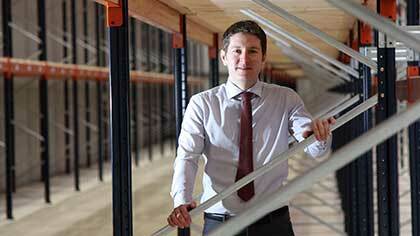 Managing director Matthew Stiller said: “We’re on the look-out for keen and able warehouse staff to support some new clients that we have planned to occupy this new unit. The firm’s new extension also supported dozens of local jobs in its construction. Project managed by Darlington-based ADG Architects with civil engineering support from Durham-based BDN, its main contractor is Hall Construction, based at nearby Rushyford, which awarded Aycliffe-based SCH Site Services a project to fabricate and erect its frame using 90 tonnes of steel. SCH, which has previously worked with Hall Construction on the refurbishment of buildings at PD Ports on Teesside, completed the steel fabrication and erection of the frame within eight weeks. Matthew Stiller added: “We’re very proud of the fact we have used local companies to build this new development, which is supporting local jobs. Stiller reported a turnover of just under £12m at the end of 2016, which Matthew Stiller says was a strong financial result for the company formed more than 60 years ago. The new warehouse takes Stiller’s recent investments in equipment, people and property to more than £6.4m in the last three years. The firm has invested heavily in a fleet of new trailers and spent £1.1m on a new warehouse which increased its warehousing capacity by nearly 50%, while further cash was ploughed into two new external storage areas, totalling 32,000 sq ft, in 2016.